This document will provide instructions, technical details and guidelines for integrating a Google Cloud environment with the Telnyx network backbone. The VXC will allow you to bypass the Internet and allow direct private access to the Telnyx telephony engine, thereby eliminating hops and reducing the risk of packet loss and jitter. You’ll also benefit from the additional security of direct interconnection. That said, to protect against man in the middle attacks, we always recommend that you encrypt both signaling and media with TLS & Z/SRTP. 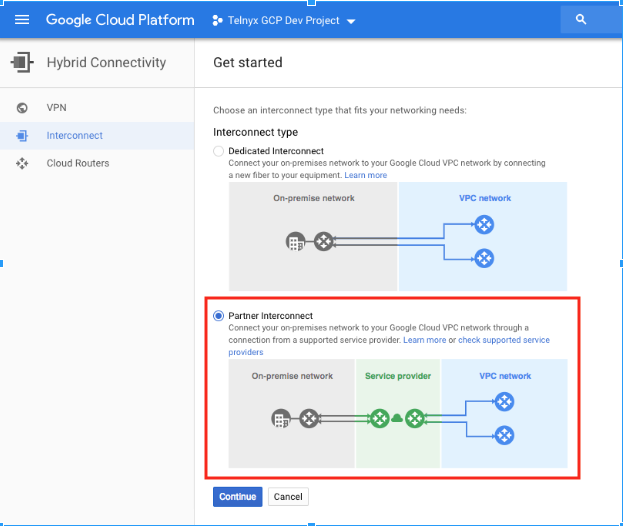 Follow the steps below to create a private connection between your Google Cloud Platform (GCP) and the Telnyx network. 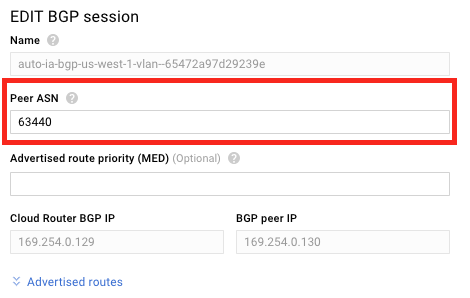 Activate the Virtual Cross Connect in Google Cloud Console. Partner Interconnect connects the Telnyx network to your Google Cloud VPC network via a service provider. 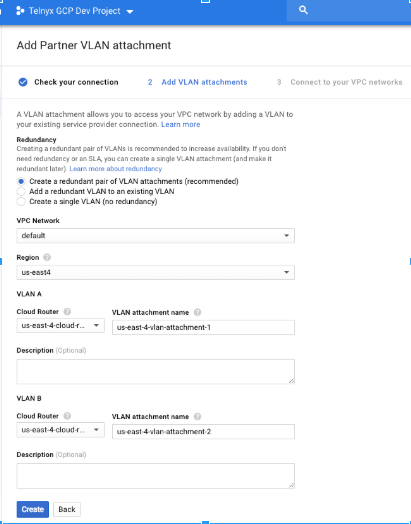 VLAN attachments are connections between your local routers and Google Cloud routers for your Partner Interconnects. You can follow Google Cloud instructions here, or follow the steps below. Open the Google Cloud Platform VPC at https://console.cloud.google.com/hybrid/interconnects/. Select VPC network and Region: The region should be the same region where you’re running the software application. Create and name a Cloud Router for one or both VLAN attachments: The router will be created in the same region as your VPC Network. View VLAN Attachment Detail to retrieve your Pairing Key(s). You will need this for Step 2. A Network uses Virtual Routing and Forwarding technology to provide you a unique routing table within Telnyx routers. A Site is a Telnyx Point of Presence (PoP) where we house our network gear. Create or Select Network: In the Networking section of the Mission Control Portal, either click on Create New Network, or View Details on an existing network. Add or Select Site: In the Site detail section of your network, either click Add Site(s) and then Create VXC, or click Create VXC from an existing site. You should select sites that are local to your Google Cloud Region(s). See a list of Telnyx Sites and their local Google Cloud Regions here. Select Google Cloud as your Cloud Provider. Click Next. Select Bandwidth Speed. Click Next. Review New Virtual Cross Connect (VXC) Request. Click Create VXC. 3. For each VLAN Attachment under Actions, Click Configure BGP. 4. In EDIT BGP session, in the Peer ASN field, input 63440. Click Save and Continue. 5. Click Refresh. Status should say Up. 6. Copy the Cloud Router IP for each VLAN Attachment. You will need this in the next step. Copy the Cloud Router IP for the first VLAN Attachment. Click Save. If you have a redundant link, copy the Cloud Router IP for the second VLAN Attachment. Click Save. 2. Telnyx will approve your request (this may take up to 3 hours). Order Status will change from Pending to Active to Complete. Once an Order Status is complete, the BGP session between Telnyx and Google Cloud will be active. 3. To receive traffic from Telnyx, your cloud hosts must have public IP addresses configured. Consult your Telnyx representative before clicking 'Enable' if you need assistance. 4. Under routing status, click the button to enable. Doing this will transition packet delivery from your Cloud Provider's Internet transit to the private Virtual Cross Connect resulting in a brief traffic disruption.